Design Blog: What is HeroCraft? I post a lot about a board game I'm working on, tentatively called HeroCraft. Before this point I haven't posted anything specific about it since the game was amorphous and constantly changing, but that meant no one reading this had any idea of what the game is. Moving forward I wanted a post I could reference back to that gave a general overview and some context for the latest topic I am writing about. So, here it is! HeroCraft is a board game for 2-6 players with emphasis on player customization and goals. Players assume the role of a generic fantasy character based on three colors: Red, Green, and Blue, each of which has a focus on Physicality, Guile, and Willpower, respectively. 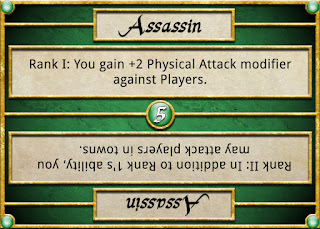 Players choose a set of starting Attribute cards which act as special abilities. For example, one of my favorite characters is a Red character (who has high starting HP) with three Blue Attributes; a tanky mage. Currently there are 24 Attributes to build a character from, and they can be any combination of colors. Once players have crafted their hero (get it?!) they set out into an open world represented by a hex grid board. Its up to the players to decide how to play their game as there are multiple game modes and play-styles available. 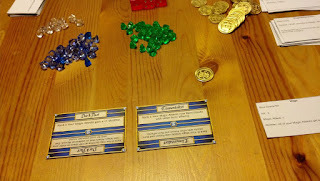 The default game mode is Questing which is indirectly competitive: the first player to complete a set number of Quest cards wins. Players can ignore each other and complete their Quests, hunt down and kill each other in PvP duels, or work cooperatively to bring down Heroic Monsters. The board is divided by a river into two halves, the Eastern and Western lands. Players move around the board and roll Encounter dice based on the space they landed on; the dice yield either Hazard cards or Boon cards. Hazards are comprised of Monsters and Traps, both of which must be defeated for Experience Shards. Boons are helpful cards and are made up of Items, Spells, and Followers, each of which increase the player's overall power. Players spend their Experience Shards to upgrade their Attributes (which unlock new powers) and their Boons. Some Boons have multiple upgrade paths to choose from which allow players to customize how they want to play. To further illustrate my character mentioned above, I played a Red character with three blue Attributes: Wisdom, Summon Familiar, and Elementalist. Wisdom gave my Magic Attacks a better bonus, my Familiar granted a passive bonus (I choose Toad for even more HP), and Elementalist granted the power of Poison and Burns to my attacks. I grabbed a few Spells and a Wand and rocked out. On the other side of the table, however, my friend played Green character with 1 Green Attribute and 2 Red Attributes. He could easily win in a duel against me because he had a much higher HP and steady attack, and the Magebane Attribute that gave him a bonus when fighting magic users. 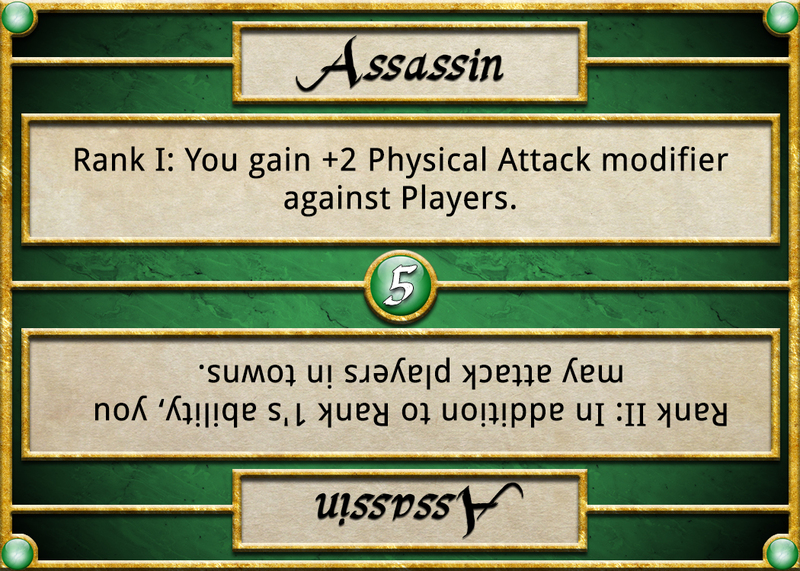 Another player had the Assassin Attribute upgraded which allowed him to attack players in cities where we normally would be safe. There were two big challenges that I set out to conquer when making this game: complexity and time length. 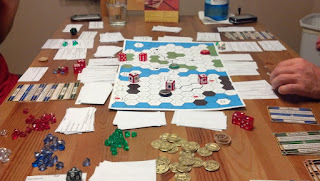 I wanted to do what seemed impossible from my experience, to create a board game that could be played in less than two hours with a deep but easy to learn combat system. It's still early, but I'm confident that I've succeeded in both with HeroCraft. 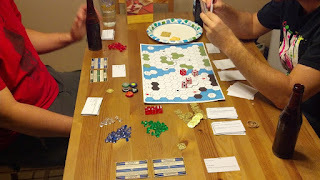 Here are some pics from my playtest session last week (v0.6). I'm currently working on the next big set of rules, balancing tweaks, and additions (v0.7). If you're interested in learning more about the game shoot me an email at andymaul123@gmail.com and I'd be glad to explain. I plan on releasing print-off versions of the game when it hits beta status (v1.0) later this year.